Edited by the NCRR Editorial Team, led by Lane Hirabayashi, UCLA emeritus professor and published by the UCLA Asian American Studies Press, the book will be released to the public at a book launch party from 2 to 4 p.m. Saturday, June 16, in Garden Room A at the Japanese American Cultural and Community Center in Little Tokyo, 244 S, San Pedro St. Los Angeles. 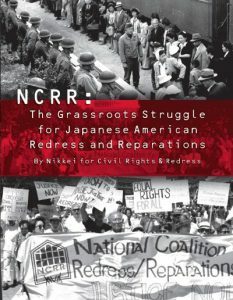 “As we commemorate the 30th anniversary of the Civil Liberties Act of 1988, NCRR is proud to share this book about the importance of the grassroots contributions to the passage of the act and the impact and power of activism on individuals, our community and for posterity,” said Kay Ochi, co-chair of NCRR. The NCRR Editorial Team, including Richard Katsuda, Suzy Katsuda, Kathy Masaoka, Ochi and Janice Yen, worked with several contributors to the book — those who advised them, wrote articles, loaned their photos or helped to edit and index. Hirabayashi started five years ago with the task of editing a wealth of material into a 400-page book without sacrificing the heart of the stories. The result is a visually attractive book designed by Los Angeles-based artist Qris Yamashita. The book is full of photos, taken mostly by NCRR members to complement the individual stories. Karen Umemoto, director of the AASC, and Hirabayashi will share their perspectives on the book’s importance and its impact on the Asian American Movement. Attendees will be able to meet many of the contributors, view historical slides, and enjoy poetry read by traci kato kiriyama and Miya Iwataki as well as refreshments provided by NCRR’s planning committee. Read more about the book at the Rafu Shimpo: Book Launch Party for ‘NCRR: The Grassroots Struggle for JA Redress.